Showing results for tags 'kastrot'. It had taken nearly six months to get her little palace the way she wanted it again. The Cloud family crest on all the tapestries, the lovely carpet rugs laid out, nice and tidy. The vineyard was at least in decent shape. Having been tended by some pony at least. Taking over the books had been a chore in and of itself. However, Stormstride found it now to be simplistic and rather amusing. She had selected her own servants, bought a few that were "owned" and then set them to work in the household. Though she made certain that the servants had large spacious quarters. Well tended servants oft did far better work. As her mane dresser was brushing the last knots from her mane and tail, Stormstride looked upon herself in the mirror. She had become rather shapely and graceful since she had taken the title of minor noble. She had also indulged a bit in the local culture. Making well and certain to be seen and heard when she had the chance and it was her turn to speak. She had become a regular at Heart Stopper's court. Watching and snickering with the other unicorns. Her eyes cast to the lavish dress. the wedding dress she was going to wear today. It was a beautiful thing. A pure Kastrotian design. The soft, silken fabric that covered her from neck to hoof in a long soft draping. Golden tail bangles, engraved with both the Heart family crest, and the smaller Cloud family crest. Stormstride had her ears pierced now, displaying a rather elegant set of ruby and sapphire earrings. Having come from her personal bath to her private chambers for dressing she smiled in the mirror. Watching her mane dresser work her own magic. Stormstride was fair. Most of these ponies didn't make a wage. But in exchange, they had free room and board in a secure castle. Storm had selected several ponies as her own personal guards. Trained them in her style of combat and tactic. And added to that she saw too it that every foal on her lands was given a decent education. Beyond the basics, and into more socialite matters. Art, history, politics. She wanted every pony under her crest to understand how the laws worked and were made. Though many had no say so in such a matter, it was at least better to instruct them to a level they could easily understand and know the laws. This made matters much easier to deal with when it came time for Storm to handle her own court matters. IN six months the castle had gone from an over sized storehouse, to a rather lovely little castle. Housing surrounded the outer wall, made for servants and field workers alike. Each was set up for a small family. There was a large public bathhouse for them as well. But inside, things were more lavish. Stormstride kept a few of the prettier ponies on the top floor with herself. Ponies like her mane dresser and her interior designer. Housing them in comparably luxurious quarters. Feather Touch however, shared her room with her. Except for today. Today he was in a rather large guest room, being prepared by the castle tailor. Feather had it better here than he had ever had it in Canterlot. All the supplies he would ever need to make his candles, oils, and lotions were brought right to his own personal work space at no cost to him. He was tended nightly by a full bath treatment with Stormy. The food was amazingly good. Stormstride had hired a chef that knew both Equestrian and Kastrot styles of cooking. The castle had fireplaces in every room. And he and Storm often sampled the wine together. This was a rather amazing thing. And yet in the back of his mind, he felt this creeping feeling. That something was not right. That Stormstride was in danger of becoming something....evil. His ear perked to the sound of music floating up the stairwells. Thunderbuck was warming up his instruments. He had arrived a couple months ago with CaramelCream. The sweet young pony ran her hooves off. Up and down the stairs, learning and exploring everything she could find. Storm was content to let her do so as long as she tended to her lessons. And CaramelCream was always first one to class. Feather Touch had taken to the foal. He often awoke to find her snuggled between he and Stormy, cuddling under his wings. She had once called him daddy. It had startled Feather a fair bit. Being suddenly called her daddy like that. She had not said it since then. But he secretly wished she would. Today, she was serving an important role. She was the flower foal, and in charge of leading the guests to their places in the courtyard. Thunderbuck was set up on a proper stage. His home was in the courtyard, a small cottage with supplies for him to repair and maintain his instruments. Stormy gave him an allowance to purchase instruments, though he often bought the broken ones. He had begun to look into opening himself up to instrument repair for hire. This would allow him to generate greater income. The courtyard was very delightfully decorated, adorned with the Heart family crest on each seat and on the main podium. Under it was the Cloud family crest. Both were polished and gleaming in the bright warm sunlight. Stormstride had made certain the weather would be clear today. She had hired a cake maker on Heart Stopper's suggestion. Though her own chef would be providing the refreshments and foods aside form the cake. The table was set up with plenty of chairs in case other guests arrived late or were to happen upon the wedding. Back in her room, Stormstride looked at herself in the mirror. The gold and silk dress upon her body. It was simple, but lavish at the same time. It was had several gem studded necklaces and anklets at her hooves. Stormstride had allowed her mane dresser to do her make up today, making her look more the part of both a noble lady, and a ravishing bride. Stormstride thanked her mane dresser and let her go for the day. She was going to have the rest of the day off, to relax after several hours of hard work. Storm moved to her balcony. Looking out over the courtyard. She saw her brother below. He was already dressed in a new tux and wearing his mask. She had had it polished for him and repainted the way he liked. It made him comfortable and she thought it made him look like a mysterious stallion like that. He had also put on a bit of weight. Not fat, but enough that he no longer looked as though he was hungry all the time. She saw the guests beginning to arrive and smiled, moving down to the main hall to greet them and offer wine until the ceremony started. As she came to the entry way, she looked up. The chandelier was still off to the left a touch. Her horn glowed faintly as she used her magic to move it into the proper place. She would have to have a construction pony in here soon to fix that. She did not want that rather expensive piece to crash to the ground. She saw CaramelCream looking in one of the large mirrors. Smoothing out her dress and making certain her orcid mane piece was in the proper place. Coming over she gently nuzzled the foal on the ear. "Hello my sweet foal. how are you feeling?" Caramel smiled at Storm, whom mouthed her words again. CaramelCream, being deaf, had to rad lips, and had grown very skilled at it. Once she understood what Stormy said, she smiled and spoke. "Im happy Momma. You and daddy are getting married today!" Storm smiled happily to the foal. "Indeed little one. Now you go prepare your flower basket. The guests are arriving and soon you will help them to find their seats." Caramel smiled and trotted off happily. Stormstride walked to the doors of her castle, magically opening them and smiling brightly as she greeted her first guests. "Welcome to Castle Cloud!" she said cheerfully. Lady Stormstride Cloud of Kastrot in Battle Armor. This lovely piece was created by our own Discord player RexDraco. (is best discord ever) A bit of background on this piece. Stormstride is a bit of a bitter pony toward most others. Indifferent toward their suffering or emotional state until it directly impacts the well being of one of her own family or direct friends. She's seen several battles, and finally had enough of the inadequate armor that the normal REA soldier is issued. She commissioned a private suit of armor. Not made of the golden alloys as the normal armor, but this was to be made of Silver, Moonstone, and Malacite. A gleaming silvery metal alloy with a slight green hint in the reflection pattern. Each large circle is a gemstone she had placed into the armor. Each stone is enchanted to draw in any magical energy around it, and channel it up for her use as a weapon of shield. She can store excess energy in the gems, or use them to absorb a fair portion of an incoming unfriendly spell. While she will still take an impact from that spell, its power will be greatly lessened. Looking to her hooves there is a set of horseshoes permanently mounted to her with hard steel screws going through both sides of her hooves. Painful at first yes, but once healed it did not bother her. These shoes provide her a single enchantment. She can channel her magic through them to immediately summon her armor and various weapons to herself. This provides her with a slight, but distinct advantage in the event a peaceful situation becomes aggressive. "Never let your armor get dirty. Never let it collect dust. Never leave your weapons soiled. Because when you fail to take care of your armor and weapons, they will return that favor in kind," Stromstride Cloud, speaking to her honor guard during training. © Stromstride is copyright to myself. All depictions of her, or any other of the Cloud family lineage are the express intellectual property of myself. recruiting Who's afraid of the dark? Name: Lead Hammer Gender: Male Age: Adult Species: Earth Pony Eye colour: Straw-yellow Character colour: His coat is mostly dull-grey, though it brightens to a shinier silver at the fetlocks. Mane/Tail/Other: His mane and moustache are a fiery orange, his tail a rather dirtier shade of the same color Physique: He's genetically built for bulk, but hunger has trimmed his frame somewhat. Residence: The Maretonian City of Kastrot Occupation: Work group leader on the shipwright docks Cutie Mark: A trapezoidal-headed hammer (think the hammer from the old communist hammer-and-sickle). It signifies his talent in metal working, and in industrial work in general. Unique Traits: Aside from the subtleties of his coloration, he doesn't have much unique, as far as physical characteristics go. History: Lead Hammer was born in an Earth Pony farming village in Maretonia, to a farming family average by their standards, though poor relative to their Equestrian counterparts. The lack of harmony and cooperation among the tribes of ponies in that land made for a hardscrabble existence; with the weather and movements of heavenly bodies outside their control or influence, Earth Ponies had a much more difficult time coaxing food from the earth, and so drove a harder bargain for it, which served to feed the cycle of distrust. Not that the young colt was aware of this whole situation, or even at first of his relative poverty. The first few years of his life were as happy as most could be. He played with other foals, learned the trade of his parents, and regarded himself and his fellows as ‘normal.’ Of course, most of those ‘fellows’ were other earth ponies, and he heard the elders grumble about ‘those dang unicorns in Kastrot’ to whom the village was obliged to pay taxes, but of active oppression he felt nothing. Cutie Mark Story: Feeling thus free to live and exercise his talents, he would do various jobs on the farm, or help out at village events, searching for what his calling in life was. One day, his village, which was on the banks of a river, was holding a boat-building festival, to repair and replace the fleet of shipping barges used to communicate and trade with the downstream city of Kastrot. One of the elders had an idea that more might be safely floated if the hulls had metal plating to guard against collisions. How this was to be done was something of a mystery, so the festival was used as a contest, with village teams building a boat, and the one that handled best would win a great seat at the feasting table. Lead immediately joined one of the teams, and the incessant enthusiasm and high spirits he brought to the task made it easier for everyone to work together on the job. In the end, it was that boat design which was adopted by village, winning Lead a seat of honor, and his cutie mark. Shortly after this happy event, one of the famines that would periodically make a hard life harder in Maretonia swept through the region, irreparably fracturing the village’s economy. The land would still support a few farmers, but the artisans and shopkeepers could no longer stay, and so had to find somewhere that would take them in. Lead Hammer was among those who left, as his working talents were more suited to the docks and shipyards of Kastrot than any employment the nearby villages could provide. So, he floated down the river on one of his metal-hulled boats, offering it as a resume to potential employers. It was upon arrival that the Lead was made aware of just what it meant to be an earth pony in a city of unicorns. Being somewhat naïve, he took the first job offered, which was a bottom-tier position, in return for sharing the secret of a strong but buoyant metal hull for a small river-barge. It was not until later, after weeks of long hours for little pay, watching the money pour into the coffers of the dock masters, that he realized how raw a deal he’d gotten. This was only the first of many stings he was to endure in Kastrot. At first, he tried to pass them off as what any newcomer might expect, and kept his old attitude, winning the friendship and support of his fellow dockers. But as the days went on, Lead couldn’t ignore the fact that he, his friends, and his kind, were part of an underclass, and it is not too much to say that he resented the fact. Open expression of dissent was out of the question; that could cost you your position, and Lead had only recently gotten a promotion to a better pay grade. For an earth pony to be without position in Kastrot was to be consigned to the lowest of the low, the scattered and homeless that lined the embankments, hoping that the ruling class and their officers would leave them alone. No, Lead began to act in a less confrontational way, at least at first. He formed a network of mutual support amongst his fellow-dockers, the Committee for the Defense of Workers. His developed personability and leadership skills served him well in this position, and he convinced them to begin extending it’s scope, not only reaching out to other docks, but to the positionless as well. All this went along, more or less ignored by Lead’s supervision… until they proposed a new pay grade that would put earth ponies above pegasi. The intention was to divide the two tribes in sympathy, so that the incipient cooperation observed would break down, and so leave the unicorns unopposed. The attempt was a clumsy one, and probably would not have passed muster if the duke of the island had been consulted about it. As it happened, the dock management found itself contending with Lead Hammer, who managed to mobilize the Committee, earth pony and pegasus alike, in a strike. It was a dicey thing, when the day came. The strike had to be an occupation, else the management could just fire the lot of them and bring in new workers from the embankment. But a contingent of dockworkers fully equipped an occupying the cranes and machines would be much harder to get rid of, without destroying the facility. In the end, however, the duke was notified of the disturbance, and soon put pressure on the management to cave. Whether out of care for the justice of the case, desire to get the docks working again, or simply to avoid bad publicity with foreign observers, no one knew. All they knew is that a victory had been scored. These are heady days now, for both Lead and the Committee. There is much promise in the air, but danger as well. He knows perfectly well that he has made himself a hero, and a target. He has no desire to overturn the established Houses that rule the city, whatever the rumors say, but he’s not backing down until he’s satisfied that he’s getting a square deal out of them. But is even that too much to ask? Only time will tell… Character Summary/Personality: Lead Hammer has what few in Kastrot expect anypony but a unicorn to have, significant political acumen. He can be personable with others if they don’t talk down to him, he knows how to get ponies to work together on a thing, and he knows when to compromise and how to cut a deal. This last tendency irks some of the more radical members of the CDW, but it has probably saved the whole body from destruction at the hooves of the elites. Being a ‘stallion of the ponies,’ he has little respect or toleration of the upper classes or intelligentsia. He’ll talk to them, but unless they've come to bargain, he won’t extend any effort to make himself liked. And he can be quite the tiresome pony in that case, especially to those who are annoyed by rough manners, brash tones, or crude speech. While having little respect for the learned, he’s not opposed to learning as such, having had to find ponies willing to teach him how to read and write well enough to do his Committee work, which includes educational support. His public speaking skills are dependent upon whether he speaks extemporaneously, or with a prepared speech. Extempore, he is rather witty and charming, in a folksy manner. With a prepared speech, he is stilted and most unimpressive. Hence, his public actions have something of the impulsive about them, which makes for as much trouble as triumph. 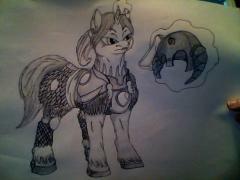 Name: Acantha Gender: Female Age: Mare. Species: Unicorn Eye colour: Rich mauve #E285FF Character colour: Russian violet #32174D. Mane/Tail/Other: Bright white laced with thin streaks of periwinkle(#CCCCFF), pale lilac(#DCD0FF), and lavender blush(#FFF0F5). She sports a sidebang and her mane is cut in an angled, asymmetrical style with that’s short on the right side of her face and gets longer towards the left. The length of her mane on the left side of her face reaches past her chin. Her tail is long, but she keeps it tightly braided - coming from a land of conflict, it’s habit for her to keep her mane and tail suited for combat. Her hair is naturally thick, soft, and wavy, and she keeps it well-conditioned so that the inevitable static that comes from practicing lightning magic doesn’t mar her appearance in the slightest. Physique: Tall and toned. She has curves, but overall maintains an athletic figure. Her coat is silky smooth and as well-conditioned as her mane and tail. Residence: The castle of House Erinys in Kastrot is her home, though she’s taken on the life of a vagabond in recent years. Occupation: Coming from one of the ruling houses of Kastrot, Acantha lacks a true occupation. With no talent for politics, she left home after her family had been restored to its former glory in order to consume every last scrap of aetheric knowledge in this world by witnessing it first-hand and passing any valuable information she finds to her brothers, who have assumed leadership in her household. Every bit of truly impressive magic she comes across in her travels she analyzes and deconstructs, committing the information to memory so that she may relay everything to her brothers, the twins Phobos and Deimos. Nothing is recorded, nothing sent by mail - all valuable information is passed to her brothers by Acantha directly, just in case any of her mail is being intercepted by scheming nobles in their fair city. Cutie Mark: A burst of lightning streaks that highlight soft impressions of clouds that fade into the dark tones of her coat. The colour and design of her mark make it appear as though her body is a single, looming stormcloud with lightning flashing across her flank. Most young fillies wonder what sort of cutie mark they will proudly wear on their flanks as adults: Acantha of House Erinys was not one of those fillies. She was born into one of Kastrot’s great bloodlines, a unicorn family that has been known since its inception (as far as they know, anyhow) as having a strong presence elemental mastery. Wind, water, fire, lightning, earth, plants, metal, ice: countless ponies in her family tree have mastered one or more of these elements, many of which have made it into Maretonia’s historical records. Acantha was raised bearing this knowledge, and a hunger to live up to her family’s former reputation was planted in her heart and mind at a very young age. She and her older twin brothers, Phobos and Deimos, grew up with the weight of restoring their house to its former glory upon their backs. It was what they were groomed for by their grandmother and their parents, so from the moment they could summon any sort of magical energy through their horns their lives were transformed into a never-ending magical bootcamp. Their lessons began with attempting spells from each of the elemental practices. From the moment Acantha first cast her first lightning spell, she knew what she was destined for: the thrill of electricity racing through her and crackling out from her horn for the first time has remained the most joyous memory of her life. There was great power in the magic she cast, and she wanted more. It was little surprise to her, then, that her cutie mark sprung to life upon her flank the moment the spell was cast. Acantha was born confident and sure of herself; she never second-guessed herself and never had to wonder at what life held for her. She knew what she wanted, and she would make her dreams a reality. That part of her personality is exactly why, despite her young age, she knew what life had in store for her the moment she summoned her first bolt of lightning to existence. Unique Traits: Acantha has training in hoof-to-hoof combat, throwing knives, and the use of short bows. She is quite good with these forms of combat, but her true talent is found in magic. She is a lightning mage, a unicorn who wields the elemental force of electricity for combat. Though she is more than the average mage - she is a master of the art. She can cast bolts of lightning, chain lightning, and can even summon lightning storms down upon a battlefield temporarily. Her signature move, however, is to summon up a snake-like charge of lightning that she uses as a whip and lasso. It’s a double-edged sword, however. A magic as destructive as lightning, when wielded improperly, can cause damage to its caster as much as its intended target. If Acantha loses her focus, she’s the one who ends up in tatters. History: House Erinys is one of Kastrot’s great families, and every head of house in their history has been a member of the Assembly of Heads, at least until her great grandfather came into power. Once he claimed rule of their island, his thirst for power grew out of control. He wished for House Erinys to hold power over every respected bloodline of elemental mages in Kastrot and aspired to overtake the ruling families that boasted such bloodlines. With the help of his closest friend, a stallion whose power was second only to his own, Acantha’s great grandfather laid claim to a minor family with a long line of wind mages. His second target was one of Kastrot’s great families, and on the night of his attack he was abandoned. His friend and ally betrayed him, abandoning him on the battlefield, leaving him to defeat and disgrace. The head of House Erinys was forced to become Unattached, leaving his family to live as low-class citizens on their own island (thanks to the “benevolence” of the traitor who abandoned them) while that very same traitor claimed their castle and assumed rule over their home. Acantha had always known that she and her brothers would restore House Erinys to a position of power where their parents had failed. It was a command given to them by their family from the moment they were born, and it was a goal they had always lived for. Once she had obtained her cutie mark, she knew that her prowess as a lightning mage combined with Phobos’ cunning and Deimos’ charisma would be an unstoppable force in Kastrot. Written theory, runic penmanship, the study of symbols and history, and of course practical applications consumed the siblings’ every waking moment in their foalhood. Breaks from magic lessons involved learning politics and physical combat. Acantha mastered hoof-to-hoof combat and the use of short bows and throwing knives, though she struggled to grasp politics at all. Her personality was much too straight-forward for the intricacies of politics, and so she instead focused her efforts to mastering lightning magic. All of their lessons were held in secret, to keep the current head of Castle Erinys ignorant to their plans. From fillyhood to marehood, Acantha worked alongside her brothers to win the favour of the lower-class ponies on their island. Thanks to the tyrannical rule of the mare named Kleio, those who struggled on the bottom rungs of their society were eager to join the effort to overthrow her. They plotted in secret alongside the Erinys siblings until eventually their makeshift army rose up and overtook the island. Their power was restored. Phobos, the eldest sibling, began to rule over their island as the head of House Erinys once more. Thanks to Acantha’s friendship with Daedalus of House Sardonyx, his father spoke in favour of Phobos when they appealed to the Assembly of Heads to come back into full power. The Assembly allowed Phobos to join them after being convinced that keeping him near meant they could keep close watch over the upstart twins and their sister. The Erinys siblings were troublemakers: putting together an army of low class ponies? Unthinkable. They were not to be trusted. Trusted or not, they were home. Their status, wealth, and power had been restored, and they were able to bring their grandmother back into her foalhood home to live out the rest of her days in relative peace. With her brothers ruling over House Erinys and their prosperous island home, Acantha was soon infected with wanderlust. She had achieved her greatest goal in life, and with her island at peace (her brothers’ rule was much kinder to their subjects than Kleio’s had been) there was little left for Acantha in Kastrot. Her friend and former lover, Daedalus, had long since left Kastrot, and that was just one more reason to leave. The straw that broke the camel’s back, so to speak. So she left, her love of magic driving her to pursue further knowledge of the arcane in every corner of the earth. She would seek out knowledge and artifacts, bringing them back to her brothers so they could make use of them to further restore the power and reputation of their House. It would allow her to further hone her skills as a lightning mage, expand her mind, and satisfy a hunger to see the world - so that is exactly how she is now living her life. Character Summary: Acantha is a creature bred for purpose. She didn’t have the luxury of a laid-back foalhood, and as such her personality is far from warm and squishy. She is cold, determined, and proud, a Kastroti noblemare through-and-through despite her serious lack of cunning and political knowhow. Unlike most Kastroti nobles, she has a blunt and straight-forward personality, preferring brutal honesty and frankness to playing mindgames. That’s not to say she’s thick-headed. She’s just not so silver-tongued or tricky as the average Kastroti noble. It’s why her brothers are more than happy to let her travel around the world, far from the political games of Kastrot: her personality is a liability. Magic is her only passion, the one thing that can melt her icy exterior (somewhat, anyways) and call to life an almost geeky degree of enthusiasm. Her abilities as a lightning mage are remarkable, tempered over years of rigorous practice. She embodies her magic so well that her very presence holds a feeling similar to the faint pressure of standing beneath a storm about to break, making her quite the intimidating mare. That intimidation factor is only punctuated by her tendency for cold words and a knack for speaking the truth in the most hurtful ways. Sensitive about a blemish? She’s likely to comment on it. Fail miserably at something? Count on Acantha to coldly tell you where you went wrong, how spectacularly you failed, and how you probably just disappointed your entire family. Hurtful truths - an innate talent second only to her prowess as a lightning mage. It doesn’t help that she is pretty keen at sensing a pony’s feelings with even the slightest tells: if she senses somepony is distressed, say, about love, she’ll tell them love is pointless and they’re better off marrying for some sort of advantage in life or just staying alone. It keeps other ponies at a distance, and while normally she’s quite happy about that, when she is interested in getting to know somepony better her habit of running her mouth scares them off. If her looming presence doesn’t accomplish that right off the bat, anyhow. And if somepony sees her angry? Well, that’s basically guaranteed to run them off. When she’s angry she’s as wild and unpredictable as the lightning she wields, likely to throw a punch or a zap of electricity at whoever it is that ticked her off. And if nopony ticked her off? She’ll still crackle with lightning, causing anypony who gets too close to get caught in the splash zone, so to speak. Luckily for Acantha, she isn’t exactly one for seeking out new friends. She prefers keeping her distance from other ponies where she can, remaining cold and unfriendly unless somepony really catches her eye. That normally means she keeps her distance unless she meets somepony who can teach her something new about the arcane, which isn’t easy - she is a Kastroti mare, after all. Still, as her family and the few ponies close to her know, once Acantha’s friendship and loyalty have been won she is an invaluable friend. She knows how to apologize if she says something hurtful, she would sacrifice everything precious to her if it would help them. Besies, a skilled elemental mage is always a useful ally to have in your back pocket!